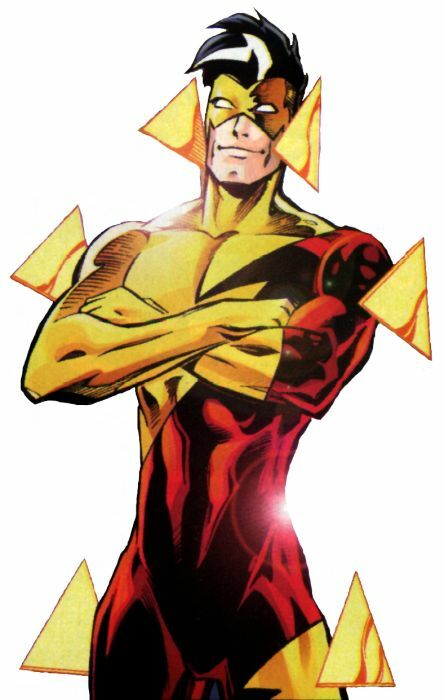 His logo and those weird yellow triangles that replaced the wings from the original Flash's outfit are actually holographic projections that hover a couple of inches off his skin. I hate them. But not as much as I hate the weird jaggedy red vein/lightning bolts running through the blue and black parts of the uniform. It looks like he's either full of lava, or this close to bleeding out. I also hate his chin strap. I'm not a big fan of those in general, and this one just makes his long, lugubrious face look even more horse-like. Most of all, though, I hate his huge, bulky, "speed-metal" gauntlets. 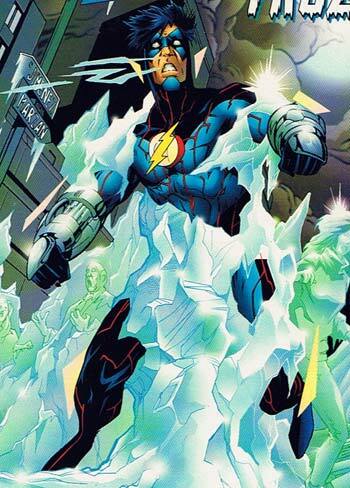 The beauty of the original Flash costume was its simplicity, with the bold red making the yellow lightning bolt elements really leap out at you. Blue and black don't convey an impression of speed, and with the red cutting crooked lines through the whole thing, it all looks broken up and clunky. The bulbous gauntlets just make it worse. Overall, this outfit doesn't make me think "oooo, speedy! ", it makes me think "oooo, cheap knock-off from the future!" He's even smooching Wally West's girlfriend in this image, as if it's not enough to steal the poor guy's name, powers, costume logo, city, and MO! I wouldn't be surprised to find out he's also licked Wally's mouse, worn his underwear, and sat in his sports car while passing gas just to make the thievery complete. Dude, I totally thought that that blue costume was cool. Now the image of him in the yellow costume with extra triangles (here: http://www.hyperborea.org/flash/bigimages/fox-1m.jpg) might be a bit much, but I liked the blue one. I guess the problem for me, Rob, is that this costume just doesn’t look fast to me. But, opinions differ, that’s what makes comics so much fun!